The US cruise missile attack on al-Shayrat airbase on Thursday, involving 59 cruise missiles launched from warships in the Eastern Mediterranean, has been framed variously by members of the Trump administration. The chemical attack earlier in the week, supposedly launched from the airbase in question, had left over 70 dead, producing a sequence of terrifying images of foaming bodies of all ages. Sources connected with the Assad regime denied that Russian or government forces had deliberately deployed the nerve agent against the civilian population, citing the explosion of an al-Qaeda chemical weapons factory in Khan Sheikhoun as the source of the calamity. In his 8 April letter to the Speaker to the House, Trump explained the action had been undertaken 'in order to degrade the Syrian military's ability to conduct further chemical weapons attacks and to dissuade the Syrian regime from using or proliferating chemical weapons, thereby promoting the stability of the region and averting a worsening of the region's current humanitarian catastrophe'. Several elements are discernible: the national security concept of instability caused by chemical weapons proliferation; the humanitarian rationale of civilian protection, averring to the idea of the Responsibility to Protect doctrine that suffered considerably after the 2011 strikes on Libya; and plain speaking power. International lawyer Harold Hongju Koh last year outlined a series of tests in the Houston Law Review, all of which are merely capitulations of the Responsibility to Protect doctrine in modern, post-Libya dress. Humanitarian intervention would, for instance, be lawful to halt 'consequences significantly disruptive to international order — including proliferation of chemical weapons, massive refugee outflows, and events destabilising to regional peace and stability'. The grounds for this would be further hardened in the face of an indifferent UN Security Council, and would have to be 'limited force for genuinely humanitarian purposes' and 'necessary and proportionate to address the imminent threat'. "In any final analysis, there can be no humanitarianism on the tips of missiles." Various insurmountable problems are thrown up by these formulations. If humanitarian intervention is supposedly engineered to punish a regime in breach of obligations to protect the civilian population, it starts looking, all too often, like an act of regime change. At what point is the distinction on such matters as proportion or necessity even credible? The point was evident when it came to striking Qaddafi's forces in Libya in 2011. These acts were initially deemed to be about protecting civilians in Benghazi from imminent slaughter. The UK Foreign Affairs Select Committee report subsequently found that the then Prime Minister David Cameron had pursued an 'opportunist policy of regime change'. The quick crumbling of the Qaddafi regime, the capture of the enigmatic despot and his summary execution unravelled the Libyan state, leaving it prey to militant factions of brutality and intolerance. The results? Regional instability, a vast and unregulated international arms market, and a substantial boost to the rise of ISIL in North Africa. By all accounts, a disaster for the humanitarian argument. With an eerie sense of déjà vu, statements of varying suggestiveness have come from Trump officials justifying the missile strikes. Secretary of State Rex Tillerson insisted that no one could extrapolate from the strikes 'a change in our policy or posture relative to our military activities in Syria today'. To ABC News' George Stephanopoulous, he reiterated that the strike 'was related solely to the most recent horrific use of chemical weapons'. The fate of Assad would be a matter for the Syrian people to decide. US ambassador to the United Nations, Nikki Haley, suggested that the morphing of humanitarian strikes into a mission of regime change was inevitable. Her point underlines the dangers of embracing the virtue of calculated strikes supposedly aimed at protecting civilian populations. In any final analysis, there can be no humanitarianism on the tips of missiles. There are, however, disastrous consequences on the ground which often do little for the protective principle and everything for that of realpolitik. Whether it was Iraq in 2003 with the overthrow of Saddam Hussein, or the destruction of Libya in 2011, the lessons are there for those who care to observe them: military strikes in the name of protecting civilians do not work, and in fact impair that very purpose. Dr Binoy Kampmark is a former Commonwealth Scholar who lectures at RMIT University, Melbourne. 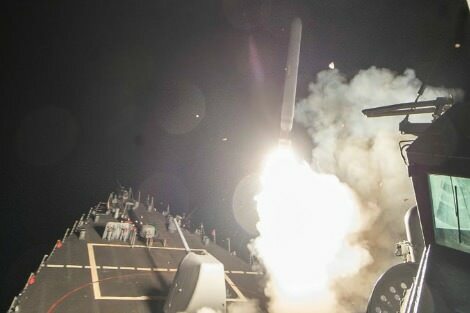 Main image: The United States fired 59 Tomahawk cruise missiles from warships in the Mediterranean at the Shayrat airfield. Recent articles by Binoy Kampmark. Excellent article. Could it be that the recent chemical weapons strike against civilians was hardly in Assad's political interests? Cui bono? Binoy, I believed the US forces and the coalition were there to degrade and defeat Isis because it is a threat to regional stability, Europe and ultimately the US homeland. ASSAD "citing the explosion of an al-Qaeda chemical weapons factory in Khan Sheikhoun as the source of the calamity." rings hollow. Government denials are routine. Recall MA flight 17. Putin denied responsibility, "In October 2015, the (DSB) concluded the airliner was downed by a Buk SAM launched from pro-Russian separatist-controlled territory in Ukraine. In September 2016, the Dutch-led (JIT) confirmed the missile type which had downed the aircraft and that the Buk missile system had been transported from Russia on the day of the crash, fired from a field in a rebel controlled area and returned to Russia after the Buk downed MH17. The JIT had established the identities of approximately 100 people, witnesses or suspects, who were linked to the transporting of the Buk, but said that their evidence "must stand before a court". source Wikipedia. Assad is not noted for admitting his crimes and it is, on the balance of probabilities, a better than even chance he was behind the civilian chemical attack. The US attack was justified. The situation in Syria recalls two old sayings: (1), “For evil to triumph, it is sufficient that Good People do nothing”, and (2), “It’s not what you do, it’s the way that you do it”. We are still in a Transition State, moving gradually from discrete sovereign nations to recognising that we are all fellow-passengers on Spaceship Earth, and needing to form One Cooperative Family, in the spirit of “One for All, and All for One.” We have a long way to go before we can achieve the right balance between the best outcome for individuals and for the whole Human Race, but unless we embrace it as an Ideal, and work intelligently towards it, we will forever be floundering. Regime change? From the Assad government to - who? Yes, regime change is the other reason for the intervention, and no, it isn't the answer for people whose society is so torn apart that it's impossible to tell friend from foe. Only the Syrian people can change the regime - oh, wait, they can't do it either...Great article, Binoy. Robert Fisk, the Independent's long term correspondent in Beirut, thinks there was much more to President Trump's strike. He thinks the Russians were informed far earlier and advised the Syrians. If this is true it makes it hard for us to imagine what the endgame is. It was reported that the Russians wanted to replace Assad with another Alawi politician who was then 'disappeared' by the Secret Police and has not been seen since. Bashar Assad - like his father and the late Saddam Hussein - is an evil dictator with blood on his hands. I did not support the invasion of Iraq but I think the fact that it gave control of the government there for the first time to its majority Shi'ite inhabitants was a good thing. There is no doubt that the Sunni majority in Syria has been oppressed. What worries me there is the polarisation between Sunnis and the large historic Christian minority and the Alawis. Assad has to go, hopefully to the Hague to be tried for war crimes. I think, eventually, the Russians and Iranians will drop him and that will be that for him. The rebuilding of Syria will be an immense task. Sadly, things will never be the same again. Cherry blossom season in Japan is anticipated all winter long but when it arrives it is nothing more than a tease. It is a kind of new year, a starting over, a washing clean of the slate and beginning afresh. But these blossoms hold in their being the promise of death. 'With cherry blossoms, we start things over,' translates my guide, from a haiku. 'And we find beauty not only in the cherry blossoms but also in how they flutter to the ground.' It's from that fluttering that we derive the most valuable of lessons.